Since 1971, SunMaster Products has provided tens of thousands of satisfied San Diego County residential, commercial, and industrial clients with the ideal sun shading systems for their needs at very affordable prices, including durable and attractive exterior sunroom and skylight shading systems which add an attractive architectural accent to their home or business properties while effectively providing the necessary amount of sun protection they desire. While sunrooms and skylights were expressly designed as a means of providing increased natural light in residential and commercial structures, depending upon the season and time of day, this influx of light and heat can sometimes prove excessive. Rely upon the sun shade system specialists at SunMaster to custom-design, hand-craft, and precision-install the ideal exterior sunroom or skylight shade to remedy this issue. At SunMaster, our exterior sunroom and skylight shades are available in an extensive selection of fabric colors, patterns, types, and densities – both solid and open weave, and feature innovative C.A.S. System™ technology. The C.A.S. System™ is a motorized track guided system with the ability to extend and retract over both flat and curved surfaces, and which was originally developed for use in shading systems designed to cover curved eave sunrooms. However, over the years, this highly efficient operating system has been adapted for use in retractable shades designed to cover a wide range of both flat and curved architectural features, including wood and aluminum patio covers, flat glass and curved glass skylights, and in sunroom shades for sunrooms from any manufacturer, for every sunroom design imaginable (including gable roof, curved eave, and flat slope roof style sunrooms. Call the experts at SunMaster Products today, for San Diego County's best value in custom shading solutions. We offer free onsite estimates throughout our service area; accept Visa, Mastercard, Discover Card, and American Express; and our office hours are Monday through Friday, 8:30 am to 4:00 pm. 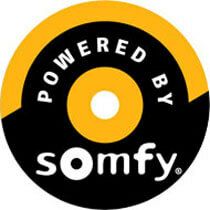 SunMaster Products, Inc. holds California State Contractor's License #288419, and is bonded and insured. Featuring the innovative C.A.S. System™ – for the ultimate in ease of sun shade system operation. 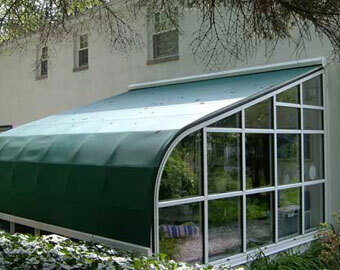 Perfect for flat glass and curved glass skylights, as well as sunrooms from any manufacturer, in any design configuration, including: curved eave, gable roof, and flat slope roof sunrooms. Offered in many types of fabrics, both open weave and solid, including: 100% solution dyed woven acrylics, PVC coated polyester/fiberglass mesh, vinyl coated polyester (vinyl), and vinyl coated polyester shade fabric. Choice of over 350 Sunbrella fabric colors and patterns.